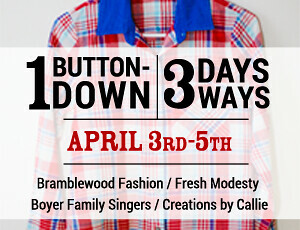 Bramblewood Fashion | Modest Fashion & Beauty Blog: Announcing the 1 Button Down | 3 Days | 3 Ways Blog Event! 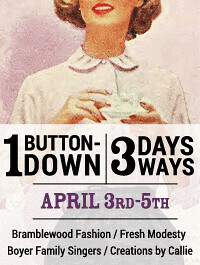 Announcing the 1 Button Down | 3 Days | 3 Ways Blog Event! 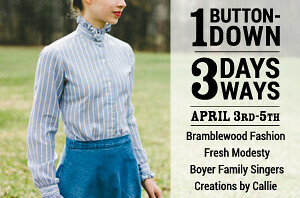 I'm super duper excited to announce Bramblewood Fashion's next blog event! 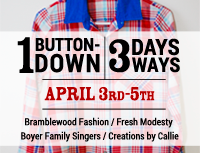 This Thursday through Saturday [April 3rd-5th], we are teaming up with the following bloggers: Fresh Modesty, Creations By Callie, and the Boyer Family Singers for the 1 Button Down | 3 Days | 3 Ways blogging event. Where each of us bloggers are going to style one button up from our wardrobe over the course of three days. This is where the fun part comes in, ALL of you can join in the fun too. Everyday we will have a link-y within our outfit posts, for you girls to link-up YOUR outfit post [using the button-up of your choice for the event]. Personally, I'm going to be styling one of my gingham button-up's for three days [haven't decided which colour yet]. 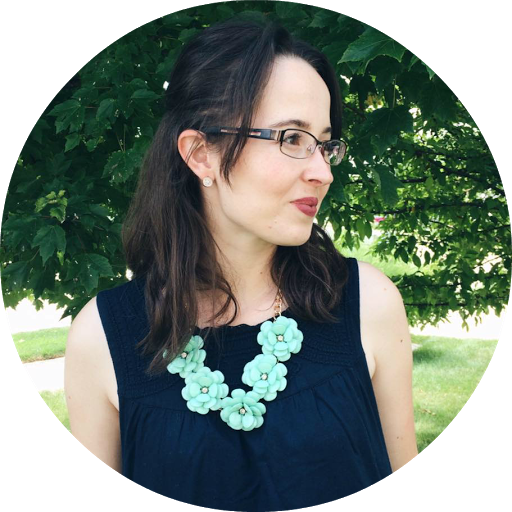 But you can use any type of button-up that you own: chambray, white, black, purple, striped, polka-dot, floral, chevron, really...the sky is the limit here. The are a few guidelines for y'all to follow, which comes with any event that I host, or co-host. Make sure that your skirts, dresses, shorts aren't too short! We want to show that we are ladies during this event. 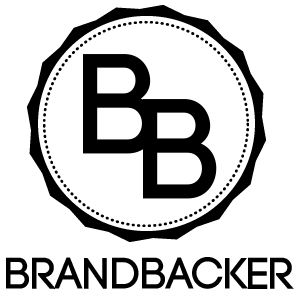 When creating your outfit post, either included one of the blog event buttons, and/or a link back to one/all of the host blogs. You can link up your outfit post on ANY of our blogs, as we will ALL have the SAME link-y code within our outfit posts. I hope that some of you will join in the fun! Feel free to share about the event with your friends, FB, twitter, instagram, anywhere really. We want this to be the best event ever, in the history of Bramblewood Fashion. This is going to awesome-sauce! :D Excited to see what blouse you choose and how you style it! Considering you ladies like vintage, I thought I would share with you a cool website on really old cool vintage dresses! Some of them are modest, and others you have to work a little with them!